As I discussed before, I have special logic for hitting tiles (i.e. walls), which is quite efficient and simple square collision to nearest tile check, and so highly specialized. 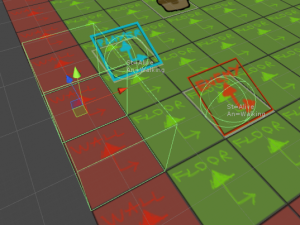 I need a whole separate way of handling different-sized circle collisions between moving entities. It’s not great that I would have two separate ways of determining collisions with different collider shapes. It also complicates the code a bit. But it’s also very reliable and fully controllable. Pros and cons. Also, the wall collisions are not “disputable”, that is, you cannot move walls, you definitively cannot pass through them, and everything needs to align precisely; there is almost no leeway. Other stuff, however, mobs and props, and projectiles, and such can theoretically bump into each other, push each other around, collide with slight errors, etc. So I went ahead and made that additional collision step where it first checks tiles, then checks non-tiles. It feels inelegant to me, but I can also justify this by having somewhat different collision requirements for the two cases. Here the player’s collider (blue) will intersect the enemy’s collider (red) if the player moves up (blue arrow). So the potential movement is flagged as “collision expected” and the movement is cancelled. The problem is determining which direction do I actually push he player? I would want to convert the movement along the tangent, then return the proposed direction, then run another collision detection with that direction. You know what, screw this. Can one really tell it’s square collisions? Yeah, probably. But I have bigger fish to fry. Though I can imagine I will get back to this at some point. Another consideration is exactly which entities collide together. For the player, it is usually intuitive and the first time you see something block something it shouldn’t, you start to wonder what the rules are. This can get pretty complicated when you consider which objects exactly are supposed to interact. Should items be hit by bullets? Should props block dead bodies? Should flying mobs block player? Do friendly projectiles hit each other? And this doesn’t even stop and a simple yes/no check. I would need to write a huge method which knows about every single entity and checks them against every other entity. 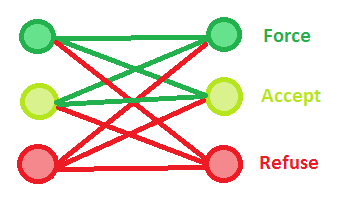 I want something more modular with less hard-coded rules. Refuse takes precedence in these rules, but that’s really just the way I structured it. I could add more collision “results”, but for now this is sufficient to describe everything in the game and on the immediate radar. Okay, this post has went on for a while with lots of text and not a whole lot of stuff to show.